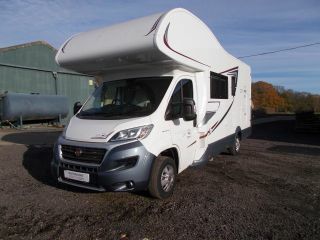 This is a versatile luxury Motorhome. Full Habitation Air Con included in this New 2017 model, all mod cons, from 2 bunks, drop down motorised double bed and another double and single bed, both electric/ gas central heating, no gas bottles. Just fill LPG at the fuel station when you fill for diesel. 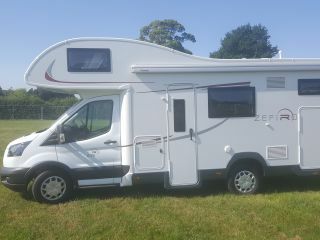 Full length fridge freezer & drinks fridge, 4 bike rack, split panel..... too much to list.... lots more to make your Motorhome hire a great experience. 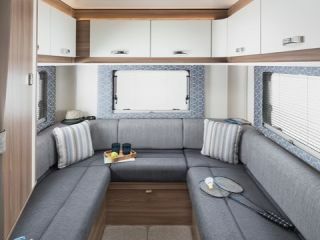 This Motorhome would work well for 2 persons being very comfortable, 4 persons would sleep well and 6 persons would have the best of all worlds. A direct payment of £1 is required for insurance purposes. Our insurer requires that the deposit and deductible (£1,250) be paid directly to the advertiser (to ensure clear and traceable payment) and not to Goboony. Goboony is not liable for any dealings with the deposit. You can still use the Goboony Carefree Travel product, but the deposit must still be paid to us in full and an extra deposit of £150 has to be paid to Goboony. Any claim against the deposit will be dealt with by us first, after which you can make a claim on your Carefree Travel insurance via Goboony. Motorhome must be kept clean, the way it is handed over is the way it needs to come back. Due to back to back hires during the main season this is respectful to the next hirer. From £50.00 to £100.00 cleaning fee if the motorhome is returned dirty.